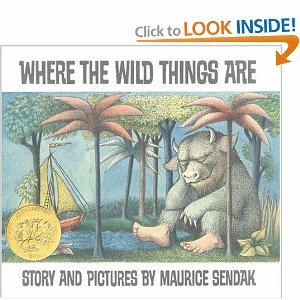 "Where the Wild Things Are" by Maurice Sendak is a children’s classic picture book that was awarded the Caldecott Medal. Its vivid illustrations and colorful language make the main character’s adventures exciting to read. Max, a little boy, is sent to his room after misbehaving. His imagination transforms his room into an ocean, where he sails away to the land of the “wild things”. Max establishes that he is the wildest of all and decides to head back home on his boat when he smells dinner. Max realizes that home is where he is best loved. The The sail design challenge will be presented. Students are asked to imagine that Max’s sail was not effective. Their challenge is to design and create a sail that will be tested on a foam boat. They need to consider the following: air movement (fan), surface area, weight and size. The students will know if their sail works if it the boat moves across a three foot span on fishing string. C Can introduce the concept of friction by showing how rubbing on the string slows the boat. The students love to participate in a race to see who created the best sail. They will be given time to do this. They will be asked to collect data regarding how far the boat moved and the amount of time it took. The students will then graph the data on a line graph. I will collect all of the data and display on one graph. In writing, the students will be asked to create another story in which Max is the main character. The students will be asked to create a different adventure for Max to experience.